A nonfiction spy book that’s as gripping as fiction. 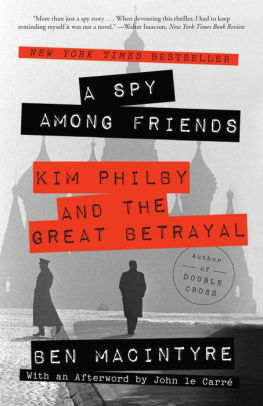 Kim Philby was an English intelligence officer in the 1940s and 50s who was secretly working for the Soviet Union, as part of the “Cambridge Five” spy ring. This book is a great mix of history, action, and espionage. Some writer! : the story of E. B. White by Melissa Sweet. In Some Writer!, the two-time Caldecott Honor winner Melissa Sweet mixes White’s personal letters, photos, and family ephemera with her own exquisite artwork to tell his story, from his birth in 1899 to his death in 1985. This authorized tribute is the first fully illustrated biography of E. B. White and includes an afterword by Martha White, E. B. White’s granddaughter. Pure scrapbook delight for the eyes and heart! Three classic tales of childhood on an island paradise – My Family and Other Animals, Birds, Beasts and Relatives and The Garden of the Gods by Gerald Durrell – inspired the recent PBS Masterpiece series, The Durrells in Corfu. The youngest of the four children, ten-year-old Gerald, discovered his passion for animals: toads and tortoises, bats and butterflies, scorpions and octopuses. Gerry pursued his obsession on the sun-soaked island of Corfu, befriended local peasants, tolerated visiting dignitaries, and caused hilarity and mayhem in his ever-tolerant family. Fauna & Family is equally delightful and enchanting. Search the catalog by individual title for books, large print, and audio cd’s. Don’t let the title and cover deceive you: this is a well written, thought-provoking book about much more than the concept of the “spinster” (or unmarried woman). The author uses that subject as a starting point to explore her own life and career along with those of several female authors with New England connections, including Edna St. Vincent Millay and Edith Wharton. This is a great book on its own, as well as a nice introduction to a group of talented writers and their works. I liked the size of this book – 320 pages. David McCullough is two-time winner of the Pulitzer Prize and many of his books are 700 pages plus. This was just right for me. I was swept away to Dayton, Ohio, middle America town life and industry, in a time before any of the big wars. Just how could two unknown, modest bicycle mechanics solve the mystery of flight, leave their sheltered small town household, and walk upon the world stage to prove it? This was such a rivetingl, painless way to experience history that I am ready to move up to Mornings on Horseback at 445 pages!